In the past few months, the world has been bombarded by smartwatch launches. Ever since Android Wear was announced in March, more and more OEMs have been releasing their interpretation of what a computer on your wrist will look like. Even Apple, famous for waiting until a technology has been perfected before releasing it to consumers, jumped on the bandwagon this month with the introduction of the Apple Watch. Despite all the promise of these devices, there is one key aspect that is crippling their potential- battery life. The Moto 360, the watch that Android enthusiasts (myself included) have been clamoring for, clocks in at 12 hours of battery life. The device that’s supposed to replace your watch, an iconic piece of jewelry that can last a lifetime, needs to be charged twice a day if you plan on going out at night. Even the larger LG G Watch and Samsung Gear Live clock out at around 36 hours and 24 hours, respectively. Apple hasn’t officially disclosed its watch’s expected battery life but leaks indicate it will be roughly a day. The industry has settled on the expectation that these devices will need to be removed and charged alongside the consumer’s smartphone every night. It’s not as if these established companies couldn’t produce a watch capable of lasting longer. Pebble, originally funded by Kickstarter, was one of the first modern smartwatches introduced and gets 5-7 days of usage before needing a charge. Using a low powered LCD display means tradeoffs: the display is not a touchscreen and it only shows black and white images. Despite these shortcomings the smartwatch enables the same functionality as Android Wear and Apple wearables, displaying persistent notifications and allowing users to interact with pebble-optimized applications. Many tech pundits reason that larger smartwatch makers have made the right decision by sacrificing battery life to ensure the first generation products are stylish and affordable. This obsession with functionality and form over longevity is an industry trend that has been brought over from smartphones. For years we have seen exponential growth in the computing power of smartphones and minor to non-existent gains in battery life. The original iPhone got 8 hours of talk time. Six years later the iPhone 5S has increased this number to 10 hours. The popularity of phablets, or tablet-sized smartphones, has exploded, partially because the larger displays give manufacturers room to pack comparatively sized batteries in the device. Those 10 hours of talk time leap to 24 hours with the iPhone 6 Plus, Apple’s new 5.5 inch offering. Substantially increasing the size of phones to improve battery life exemplifies an issue the tech industry has struggled with for decades: battery technology is not advancing as fast as processor speed or memory capacity. 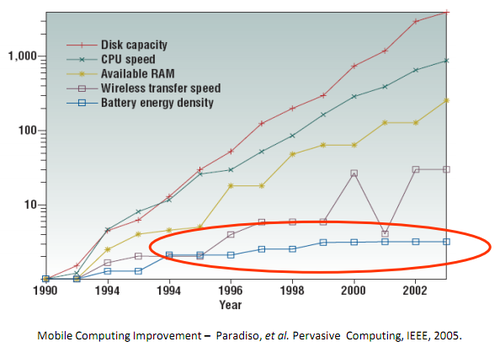 The chart below diagrams the problem: while the rest of computing continues to follow Moore’s law, battery capacity has stayed stagnant for most of the information revolution (this chart stops at 2002 but the trend continues to this day). To counter act the issues facing smaller mobile devices other aspects of the phone have been redesigned and reimagined to consume less power. Intel, seeing the advantage low power CPU makers like AMD were having in the mobile space, redid their product pipeline to ensure they were introducing mobile friendly computing power. Other promising technologies, like Bluetooth, are now finally gaining traction after being redesigned to sip less of gadget’s batteries. These types of improvements have made a considerable impact on our electronics; new devices can leverage faster processors without worrying about reduced battery life. But until new breakthroughs fundamentally change the way we store power, electronics will be held back from their true potential. OEMs see device longevity as a second class feature set and continue to prioritize speed and width. If a company can figure out how to bump up those critical specs and provide an exponential increase to battery life the mobile hardware space will drastically change forever.